Small backpack design can be used as a "Lost Pack". 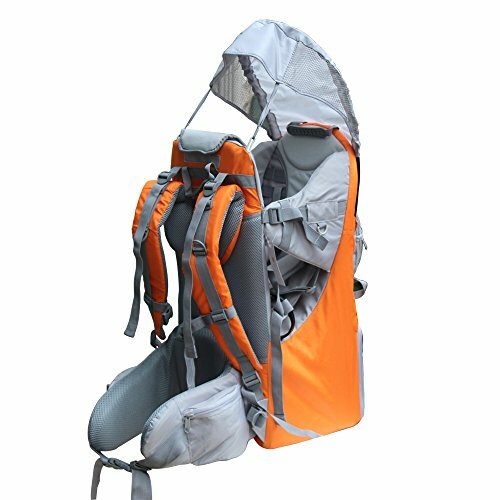 The high quality Backpack Child Carrier is made of strong but lightweight metal frame and 600d oxford cloth, It is approved by American Society of Testing Materials (ASTM) , it can withstand the elements and daily use especially for walking, hiking or even camping. Featuring multiple pockets, thick padded shoulder pads, padded waist strap, and two side water bottle holders. Extra large back pocket for diapers and necessities, which also features a safety reflective strip across the back pocket. Sun/Rain canopy can be easily removed at anytime. Ship from our US warehosue, delivery time is about 3 to 7 business days. If you have any questions about this product by TeckCool_Store, contact us by completing and submitting the form below. If you are looking for a specif part number, please include it with your message.